Canada is located on the North American continent. Cananda is bordered by the Arcitic Ocean, the Atlantic Ocean, the Hudson Bay, and the United States to the west and south. This map shows the country of Canada in shaded relief. Lower elevations are a dark green color, such as the coastline around the Hudson Bay. Higher elevations are represented with brown colors, such as the Rocky Mountains which run along the border between British Columbia and Alberta. Drainage patterns and rivers can also be seen on the map. A few of these include the Mackenzie River in the Northwest Territories; the Peace River in Alberta and British Columbia; the Saskatchewan and Churchill Rivers in Saskatchewan; and the Caniapiscau River in Quebec. The physical features of the Canadian Arctic Archipelago are also shown on the map. Google Earth is a free program from Google that allows you to explore satellite images showing the cities and landscapes of Canada and all of North America in fantastic detail. It works on your desktop computer, tablet, or mobile phone. The images in many areas are detailed enough that you can see houses, vehicles and even people on a city street. Google Earth is free and easy-to-use. Canada is one of nearly 200 countries illustrated on our Blue Ocean Laminated Map of the World. This map shows a combination of political and physical features. It includes country boundaries, major cities, major mountains in shaded relief, ocean depth in blue color gradient, along with many other features. This is a great map for students, schools, offices and anywhere that a nice map of the world is needed for education, display or decor. 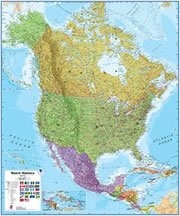 If you are interested in Canada and the geography of North America, our large laminated map of North America might be just what you need. It is a large political map of North America that also shows many of the continent's physical features in color or shaded relief. Major lakes, rivers, cities, roads, country boundaries, coastlines and surrounding islands are all shown on the map. Alert, Brandon, Calgary, Cambridge Bay, Charlottetown, Churchill, Dartmouth, Dawson, Echo Bay, Edmonton, Flin Flon, Fort Nelson, Fredericton, Gander, Halifax, Hamilton, Happy Valley Goose Bay, Hay River, Inuvik, Iqaluit, Lethbridge, London, Medicine Hat, Montreal, Moose Jaw, Moosonee, Prince Albert, Prince George, Prince Rupert, Quebec, Rankin Inlet, Red Deer, Regina, Resolute, Saint John's, Saskatoon, Schefferville, Sherbrooke, Sydney, Toronto, Vancouver, Victoria, Watson Lake, Whitehorse, Winnipeg and Yellowknive. Arctic Ocean, Atlantic Ocean, Baffin Bay, Bay of Fundy, Beaufort Sea, Columbia River, Davis Strait, Foxe basin, Georgian Bay, Great Bear Lake, Great Slave Lake, Gulf of St Lawrence, Hudson Bay, Hudson Strait, James Bay, Labrador Sea, Lake Manitoba, Lake Ontario, Lake Superior, Lake Winnipeg, Mackenzie River, Nelson River, Peace River, Saskatchewan River and Ungava Bay. Canada has important metal resources which include iron ore, copper, nickel, zinc, silver, gold, lead and molybdenum. Other natural resources include potash, diamonds, fish, timber, wildlife, coal, petroleum, natural gas and hydropower. One of Canada's natural hazards is the continuous permafrost in the northern portion of the country, which is a serious obstacle to development. East of the Rocky Mountains, the Arctic, Pacific, and North American interior air masses mix together. This mixing of air produces most of the country's rain and snow east of the mountains; sometimes forming cyclonic storms. Canada has environmental issues with air and water pollution. Some reasons for the air pollution are metal smelting, coal-burning utilities, and vehicle emissions, which impact the agricultural and forest productivity. This pollution produces acid rains that severely affect and damage the country's lakes and forests. The area ocean waters are becoming contaminated due to agricultural, industrial, mining, and forestry activities.